Generally, after creating a new report the InLoox report designer will open. The report designer issues your reports and you can adjust the report (e.g. format) there. For exporting the report you can choose between various file types. 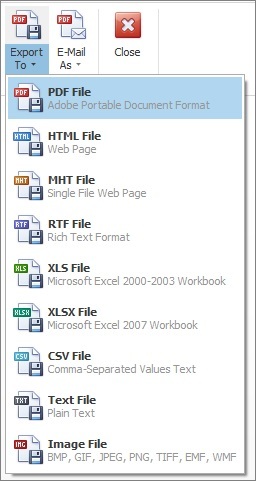 To choose a file type, firstly create a report and filter the report data regarding your needs. Subsequently, click on Create Report in the report dialog. A preview window will open. Click on Export To in the upper right corner and select the file type. If you do not want to save the report in a different file type, you can print it via the Print button in the upper left corner. InLoox report designer • Copyright 1999-2019 © InLoox, Inc. All rights reserved.